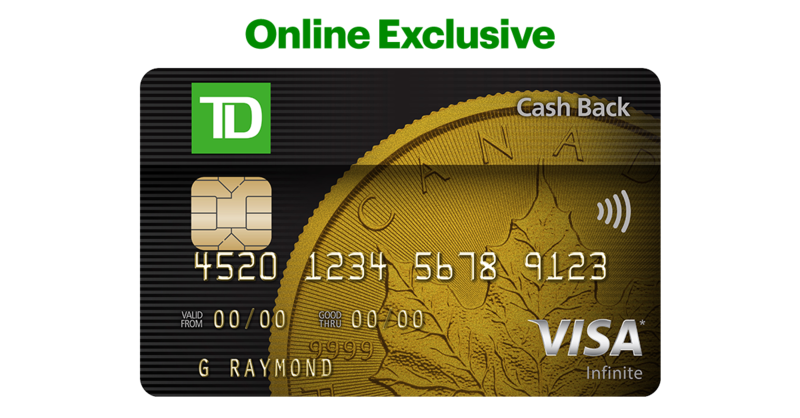 1 Welcome Bonus of 6% in Cash Back Dollars ("Welcome Bonus Rebate") applies to new TD Cash Back Visa Infinite Accounts ("Account") in the first 3 months of Account opening ("First 3 Months") to a maximum total collective spend of $3500 ("Welcome Bonus Cap") on any one or more of the following transactions charged to the Account: Purchases of gas or gas station services or products ("Gas Purchases"); Purchases of groceries or grocery items ("Grocery Purchases"); and Each $1.00 in ("Account"), and recurring bill payments set up on your Account ("Pre-Authorized Payments"). Any returned items, refunds, rebates or other similar credits on any Purchases or Pre-Authorized Payment made during the First 3 Months will reduce or cancel the Cash Back Dollars earned at the Welcome Bonus Rebate on the original Purchase or Pre-Authorized Payment, as applicable. Welcome Bonus Cap: Once the Welcome Bonus Cap is reached, any further Purchases and Pre-Authorized Payments made in the First 3 Months will earn Cash Back Dollars at the regular accelerated 3% rebate that applies to each of Gas Purchases, Grocery Purchases and Pre-Authorized Payments as set out in your Cardholder Agreement ("Accelerated Rebate"). All additional other purchases (“Other Purchases”) made in the First 3 Months will earn Cash Back Dollars at the regular rate of 1% rebate that applies each Other Purchase. Applicability of Welcome Bonus Rebate: Welcome Bonus Rebate is in place of, and not in addition to, the Accelerated Rebate. $15,000 Cap on each of Gas Purchases, Grocery Purchases and Pre-Authorized Payments: After the First 3 Months, the Accelerated Rebate will apply to all Gas Purchases, Grocery Purchases and Pre-Authorized Payments charged to your Account up to a $15,000 maximum net annual spend ("$15,000 Cap") for each of Gas Purchases, Grocery Purchases and Pre-Authorized Payments. Once the $15,000 Cap is reached for any of Gas Purchases, Grocery Purchases or Pre-Authorized Payments, then any further Gas Purchases, Grocery Purchases and Pre-Authorized Payments made on the Account will only earn Cash Back Dollars at the standard rebate of 1% that applies to all other Purchases on the Account as set out in your Cardholder Agreement. First Year Reduction of $15,000 Cap: During the first year that the Account is open, the $15,000 Cap for each of Gas Purchases, Grocery Purchases and Pre-Authorized Payments will be reduced by the actual corresponding amount of Gas Purchases, Grocery Purchases and Pre-Authorized Payments made in the First 3 Months. For example, if you spend $2,000 in Gas Purchases in the First 3 Months, the $15,000 Cap for Gas Purchases will be reduced by $2,000 to $13,000 for the remaining 9 months of the first year the Account is open. Merchant Category Codes: To earn the Welcome Bonus Rebate on Gas Purchases and Grocery Purchases, the Gas Purchase or Grocery Purchase must be made at merchants classified through the Visa network with a Merchant Category Code ("MCC") that identifies them in the "gas" or "grocery" category. Some merchants may sell gas or gas station services or products, or groceries or grocery items, or have separate merchants located on their premises that also sell gas or gas station services or products, or groceries or grocery items, but may not be classified with a gas or grocery MCC and such Purchases will not earn the Welcome Bonus Rebate. If you have questions about the MCC that applies to a Purchase, contact TD at 1-800-983-8472. Other Conditions: Welcome Bonus may be changed, withdrawn or extended at any time and cannot be combined with any other offer unless otherwise indicated. 2 Primary Cardholder remains liable for all charges to the Account, including those made by any Authorized User. Maximum of 3 Authorized User Cards on the Account. 3 Earn 3% in Cash Back Dollars ("Gas Rebate") for each $1.00 in Purchases of gas or gas station services or products ("Gas Purchases") charged to your TD Cash Back Credit Card Account ("Account") and earn 3% in Cash Back Dollars ("Grocery Rebate") for each $1.00 in Purchases of groceries or grocery items ("Grocery Purchases") charged to your Account. Any returned items, refunds, rebates or other similar credits will reduce or cancel the Cash Back Dollars earned on the original Gas Purchase or Grocery Purchase, as applicable. $15,000 Cap: Each of the Gas Rebate and the Grocery Rebate is only available to a $15,000 maximum net annual spend ("$15,000 Cap"). Once the $15,000 Cap has been reached for either Gas Purchases or Grocery Purchases, then any further Gas Purchases and Grocery Purchases made on the Account will only earn Cash Back Dollars at the standard rebate of 1% that applies to all other Purchases on the Account as set out in your Cardholder Agreement ("Standard Rebate"). Applicability of Gas Rebate and Grocery Rebate: Each of the Gas Rebate and the Grocery Rebate is in place of, and not in addition to, the Standard Rebate. First Year Reduction of $15,000 Cap: During the first year that the Account is open, the $15,000 Cap for each of Gas Purchases and Grocery Purchases will be reduced by the actual corresponding amount of Gas Purchases and Grocery Purchases made in the first 3 months of Account opening ("First 3 Months") that are subject to the Welcome Bonus in Cash Back Dollars. For example, if you spend $2,000 in Gas Purchases in the First 3 Months, the $15,000 Cap for Gas Purchases will be reduced by $2,000 to $13,000 for the remaining 9 months of the first year the Account is open. Merchant Category Codes: To earn the Gas Rebate and/or Grocery Rebate, the Gas Purchases and/or Grocery Purchases must be made at merchants classified through the Visa network with a Merchant Category Code ("MCC") that identifies them in the "gas" or "grocery" category. Some merchants may sell gas or gas station services or products, or groceries or grocery items, or have separate merchants located on their premises that also sell gas or gas station services or products, or groceries or grocery items, but may not be classified with a gas or grocery MCC and such Purchases will not earn the Gas Rebate or Grocery Rebate, as applicable. If you have questions about the MCC that applies to a Purchase, contact TD at 1-800-983-8472. Other Conditions: Offer may be changed, withdrawn or extended at any time and cannot be combined with any other offer. 4 Earn 3% in Cash Back Dollars ("PAP Rebate") on each $1.00 in payments made on a monthly or other regularly recurring basis for merchant bills, including insurance premiums, magazine/newspaper/online streaming subscriptions, membership fees and telecommunication fees, that are set up by the merchant with your consent to be automatically charged to your TD Cash Back Credit Card Account ("Account") and that are classified through the Visa network as "recurring payments" ("Pre-Authorized Payments"). You must confirm with your merchant if they can accept Pre-Authorized Payments. Any returned items, refunds, rebates or other similar credits will reduce or cancel the Cash Back Dollars earned on the original Pre-Authorized Payment. $15,000 Cap: The PAP Rebate is only available to a $15,000 maximum net annual spend ("$15,000 Cap"). Once the $15,000 Cap has been reached, then any further Pre-Authorized Payments made on the Account will only earn Cash Back Dollars at the standard rebate of 1% that applies to all other Purchases on the Account as set out in your Cardholder Agreement ("Standard Rebate"). Applicability of PAP Rebate: The PAP Rebate is in place of, and not in addition to, the Standard Rebate. First Year Reduction of $15,000 Cap: During the first year that the Account is open, the $15,000 Cap for Pre-Authorized Payments will be reduced by the actual corresponding amount of Pre-Authorized Payments made in the first 3 months of Account opening ("First 3 Months") that are subject to the Welcome Bonus in Cash Back Dollars. For example, if you set up $2,000 in Pre-Authorized Payments in the First 3 Months, the $15,000 Cap for Pre-Authorized Payments will be reduced by $2,000 to $13,000 for the remaining 9 months of the first year the Account is open. Other Conditions: Offer may be changed, withdrawn or extended at any time and cannot be combined with any other offer. 5 Earn 1% in Cash Back Dollars ("Standard Rebate") on each $1.00 for all other Purchases ("Other Purchases") charged to your TD Cash Back Credit Card Account ("Account"). Any returned items, refunds, rebates or other similar credits will reduce or cancel the Cash Back Dollars earned on the original Other Purchase. Other Conditions: Offer may be changed, withdrawn or extended at any time and cannot be combined with any other offer. 7 TD Auto Club is provided by AXA Assistance Canada Inc. The Toronto-Dominion Bank and its affiliates accept no responsibility in respect of these services. 8 Underwritten by TD Life Insurance Company. Medical and claims assistance, claims payment and administrative services are provided by our Administrator. Benefits, features and coverages are subject to conditions, limitations and exclusions, including a pre-existing condition exclusion, that are fully described in the Certificate of Insurance included with your TD Credit Cardholder Agreement. The day of departure from and the day of return to your province or territory of residence each count as one full day. 10-day coverage if you‘re under 65 and 4-day coverage if you‘re 65 or older. Note that this insurance offers different benefits, with different terms and conditions, than the optional Travel Medical Insurance that may be medically underwritten and is available to all TD customers, which you may be eligible to top-up with. 9 The goods and services Cardholders request or otherwise choose to obtain through the Visa Infinite Concierge Service are provided by various third-party service providers unrelated to Visa. Visa does not endorse, review or qualify these service providers. Visa makes no representations or warranties (either express or implied) about and assumes, no responsibility or liability for these service providers or the goods and services that may be obtained through the Visa Infinite Concierge. Neither Visa nor the Issuer is responsible for any claims or damages arising from use of any benefits or services provided by a third party. Visa cannot guarantee the successful fulfillment of Cardholders’ requests in all instances. There is no fee for the Concierge’s services; however, Cardholders are responsible for the cost of any goods or services (including any related fees or costs) authorized by the Cardholder and purchased by the Visa Infinite Concierge on the Cardholder’s behalf. All costs will be charged directly to the Cardholder’s Visa Infinite card. Coin image© 2017 Royal Canadian Mint. All rights reserved. Earn 6% on eligible purchases for the first 3 months1 up to a total spend of $3,500. This offer is not available for residents of Quebec. For Quebec residents, please click here. Redeem your Cash Back Dollars to help pay down your Account balance whenever you please (minimum amount of $25) - the choice is yours6!